By Treve Ring – Treve is a wine writer and editor, judge and speaker, and perpetual traveler. Her work appears in publications around the globe. A certified sommelier, WSET diploma holder, French wine scholar and instructor, and Sherry instructor, she is based on Vancouver Island, Canada, though is most often found on a plane or in a vineyard. You definitely do not need a reason to drink fizz, though the holidays certainly gives you ample opportunity and availability to fill your glass with bubbles. We’re fortunate that sparkling wine production has skyrocketed across British Columbia in the past few years, with producers creating sparkling stars across all styles and grapes. What makes a great sparkling wine? It’s almost too simple to be true, but it starts with a great base wine, one that achieves appropriate ripeness of fruit while holding onto brisk acidity. This provides the wine with the needed intensity and structure to transform into fizz. We’re fortunate in BC to have the conditions for just that: concentrated warmth for a ripe core, and cool conditions and a sizable diurnal shift to preserve acidity. Rooted in cool, Canada has emerged an indie darling of sparkling wine (we do share the 49th parallel with Champagne, after all). Within Canada, sparkling wine sales outpace total wine sales at +7.1% vs +4.7%. That said, Canadian-made sparkling wines account for 3-4% share of all Canadian wine, a clear sign (to me at least) that the potential future for sparkling wine is sparkling. BC leads the country with nearly 75 wineries producing sparkling wines, and approximately 40 of those are using the traditional method, the same painstaking method used in Champagne production. Chardonnay, Chenin Blanc, Gamay Noir, Gewurztraminer, Ortega, Pinot Auxerrois, Pinot Blanc, Pinot Gris, Pinot Meunier, Pinot Noir, Riesling and Shiraz are the most common grapes, illustrating that when it comes to bubbles, there is no limit. From fun and frizzante (lightly sparkling) through to ageworthy and serious, there are wines to suit all tastes, occasions and budgets. 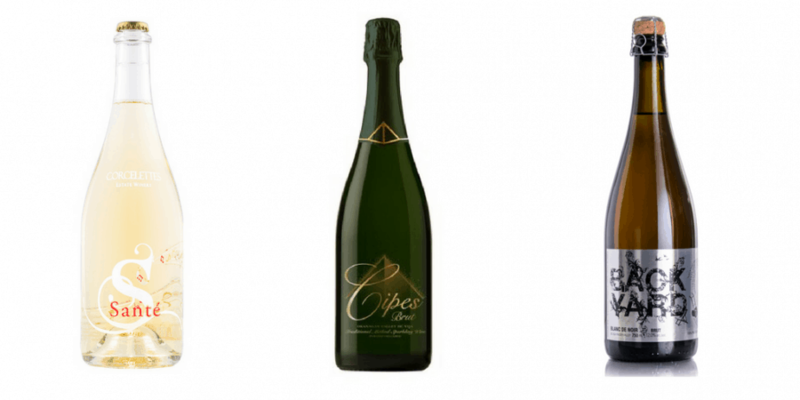 In this year’s Best of BC Wine Country Awards, Summerhill Pyramid Winery Cipes Brut sparkled the greatest, selected from nearly 2000 voters as their favourite sparkling wine overall, and their top from the Okanagan Valley. Kelowna’s family-founded and operated Summerhill has become almost as known for their sparkling wines as for their iconic pyramid on the property, with Cipes being their hallmark fizz. A BC classic, and original, this traditional method fizz is made from organic Riesling, Chardonnay and Pinot Blanc, and is full of fresh orchard fruit and light toast on a lively, dry palate. Illustrating the category’s diversity, Chardonnay was the only shared factor between the Okanagan’s top bubble and the Similkameen’s. Corcelette Estate Winery’s Santé is an off-dry fizz of Viognier, Pinot Gris and Chardonnay, fresh and fun, and in a crown-cap ready for your immediate enjoyment. Backyard Vineyards Blanc de Noir Brut took the top spot for the Fraser Valley, showing that the traditional method and Pinot Noir grape work very well together here in BC. Full of light red berries and ample toasty spice, this is a great match for local salmon. It’s also great to see that the Fraser Valley is paying serious attention to serious sparkling production, and hopefully they will inspire more to the same. 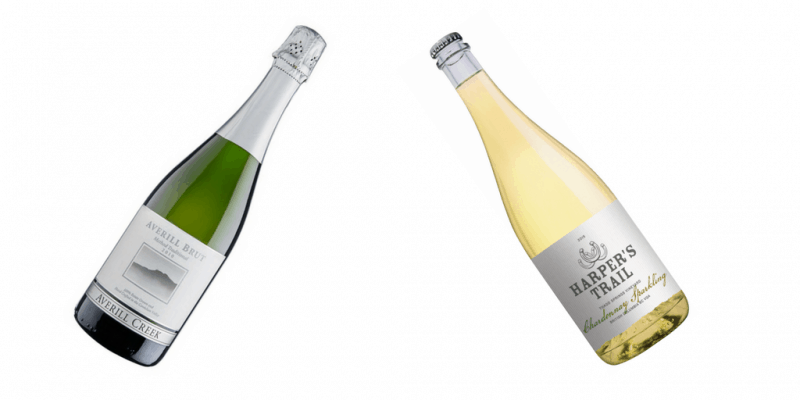 From one traditional Champagne grape (Pinot Noir) to another (Chardonnay) and the Emerging Regions top bubble, Harper’s Trail Sparkling Chardonnay. Mirroring the striking freshness that Kamloops can achieve, this sparkling wine was given no dosage (additional sugar at bottling) to preserve the region’s bright fruitiness. Dry and refreshing, this carries a lot of citrus and green apple notes. Vancouver Island certainly knows a lot about freshness – sometimes too much freshness. Averill Creek plays off the Island’s maritime-influenced acidity with ample time on the lees and in wood for complexity in their Averill Creek Vineyard 2010 Brut. Pinot Noir and Pinot Gris were barrel fermented and aged on the lees in French oak for 1 year prior to secondary fermentation and 3.5 years in the bottle before disgorging and bottling. Numerous other fizz were recognized with Honorable mentions: Noble Ridge The One, Blue Mountain Estate Winery Brut, Intrigue Wines I Do, Orofino Winery Muscat Frizzante and Enrico Winery Celebration all garnered multiple votes. It really shows the diversity and potential for all sparkling styles, grapes and regions in this province. We should all toast to that! And enjoy your holiday season.